High winds and hot temps characterized the closing day of Lollapalooza. While his set packed a definite punch, by performing under dim blue lights, closing act Jack White made it so difficult to see what was happening. White opened with the psychedelic rocker “Over & Over” which segued nicely into the Jon Spencer-like blue explosion of “Corporation.” Both tracks come from his latest album, Boarding House Reach. 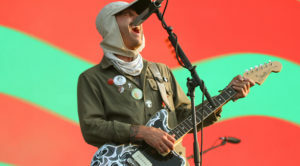 At one point prior to playing the White Stripes tune “We’re Going to Be Friends,” White recalled how he was surprised he was invited back to Lolla after “destroying everything [he] could” in his hotel room prior to his last performance at the festival. But the story concluded with his remembering how his daughter gave him the guitar pick he used to play the tune. We would describe the show’s visuals more vividly, but the lighting didn’t give us the opportunity to see things in much detail. Odesza’s headlining set at the other end of the park was much more fan friendly. Formed six years ago by Western Washington University students Harrison Mills and Clayton Knight, the band delivered an immersive live set that featured swirling lights and terrific graphics. Other highlights from throughout the day included singer-songwriter Anderson East, who played to a sparse crowd during the early afternoon. East didn’t let the small crowd keep him from delivering a compelling show that showed how he’s moved from alt-country into old school R&B. His set-closing cover of Sam & Dave’s “Hold On, I’m Comin’” allowed his 8-piece band that included backing singers and a horn section to flex its musical muscles. He described the infectious “Girlfriend” a tune for “all the ladies,” and the track lived up to that description with its woozy horns and hushed vocals. To see photos from Day 4, click here.